Any ALMA Member may nominate an industry member for an award. Winners are awarded their trophy at the Annual ALMA Banquet at AISE. Nominations may be made at any time. Beryllium Award for Chris Strahm WILL be awarded at 2018 event. ALMA International awards the Beryllium Award for lifetime achievement to people who have contributed significant service to the audio industry throughout their career. In 2017, ALMA was pleased to Honor Bob Gault of Eminence fame. For 2018, ALMA honors an industry leader that was taken from us far too soon. 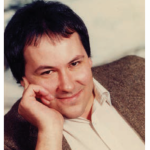 Chris Strahm, founder and President of LinearX left us on November 25, 2016.
to the industry continuously right up to his death.Much has been written about Chris, but perhaps the best tribute to him was written by Vance Dickason in the February issue Voice Coil magazine. Rather than try to recap his article, we include a link at the end of this announcement. Long time friend Vance Dickason will present the award to Chrisu2019 wife Susie, who has consented to attend our Banquet and to receive the award for Chris. Join us for AISE 2018, and our annual Banquet on January 6 at South Point Hotel and Casino in Las Vegas, Nevada. Recognizes a specific technical contribution, accomplishment, or expertise in the Audio and Loudspeaker Industries. Past winners include: Cliff Digre, Laurie Crook, Zarina Bhimani, Steve Tatarunis, Michael Oslac, Phil Bunch, J. Andrew McKinney, Jr.